In part 1, I have shown you a simple script on how you are able to list all users or under a specific location along with their membership. The problem with that script is that you can only get the groups that the user is a direct member. If a user is a member of a group and that group is a member of another group, then due to inheritance the user is a member of that group also. I have made some changes in the script in order to get also the groups that the user is not directly member of. After the script will get the direct groups of the user, it will check each group if it is a member of another group. Those groups are added in the initial list of the groups. They are saved also in another array and the script will check each of the new groups if they are member of other groups. This process continues until no group is member of another group. In the previous script, it was not easy to distinguish one group from another as the whole list was part of the same cell in the email report. Now the groups will be separated by a comma ( , ) in email. It provides a better presentation than before. In the previous script, I was using back-tick to split the code for the email. As back-tick is difficult sometime to see it in a script and might be omitted, I have changed the code to use splatting in order to send the email reports with the results. Subject = "Users and their Groups Report $(Get-Date -format dd/MM/yyyy)"
Please note that the script takes a lot of time to run. 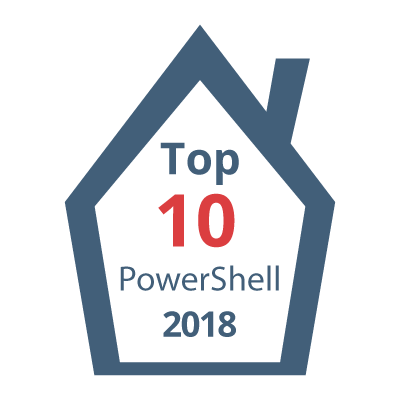 This is related to the number of user and groups that you have in Active Directory. Making the script faster is one of the next improvements on the code. Hope you like it. If you have any questions or anything else please let me know in the comments below. The purpose of this script is to retrieve all users and their current membership. it will provide the intended receipient/s with en email report with the results. Run the Get-UserMembership script to retrieve the information. 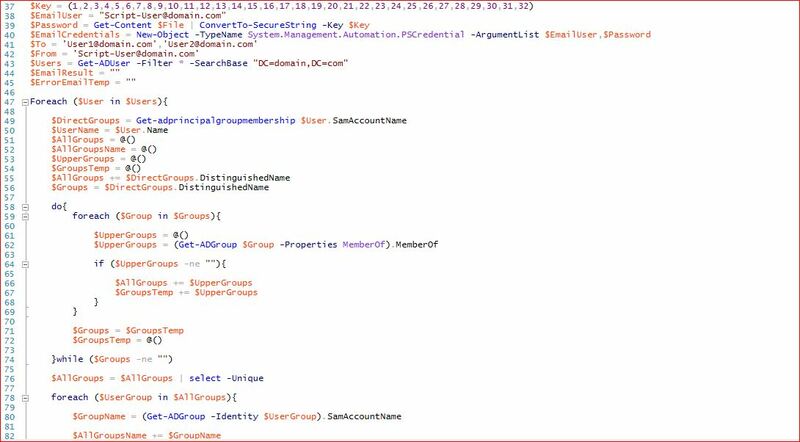 $Users = Get-ADUser -Filter * -SearchBase "DC=domain,DC=com"
Subject = "Users and their Groups Report $(Get-Date -format dd/MM/yyyy) - WARNING"
PowerShell Users and Membership - Part 2. This script will help you to list all your users and their membership including nested groups.